The text of this manuscript concerns the characteristics of different kinds of animals, plants and stones. It seems to have been made for a librarian of the Benedictine abbey at Rochester, and its artist also worked on a Psalter probably made for a London patron; he therefore probably moved around Southeast England. The illumination was left unfinished, however, so it may be that the librarian ran out of money, or that the artist was called away to another project. 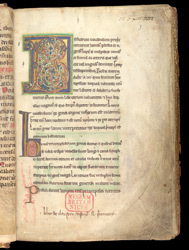 The inscription in the lower margin states the manuscript was kept in the cloister at Rochester cathedral, and implies that it was given to them by the precentor (who looked after the books), whose name began with the initial 'R'.